Multipreneurs are much admired. I don’t just say this to be smug. People often marvel at how much we get up to and the sheer number of diverse projects on the go at any one time. For us, it’s basically just the state of the nation. How it is. The way we live and work. Most multipreneurs I know are usually finishing a project, starting a project and in the middle of a project (or projects) all at the same time. Sound familiar? Maintaining mindfulness in the middle of this muddle is a big challenge. One of the key characteristics of multipreneurs is that when they take on a project, decide on a new revenue stream, or engage themselves in good civic work, they are doing so from a place of passion. Typically they care deeply about whatever it is that they’re undertaking. They’re motivated. An assumption is often made is that this comes easy. And to some degree that’s true – it’s natural. At the same time, each new plan of action puts us at kind of an internal crossroads. The important part of that previous sentence is the word new. New territory. New experience. New skill set. Newness brings with it a ton of excitement, but it can also bring a ton of nerves. One of the things I admire about multipreneurs is their sheer nerviness. (Yes, I do see this characteristic in myself as well. It’s always much easier to admire in someone else. Ask my husband). I recently posted on Facebook about an upcoming event. Pursuing my passion around food, I am – for the first time ever – taking part in a public food demonstration with a chef. I am beyond excited about this, and also really, really nervous. I do a lot of public speaking, I work with people and lead workshops and training sessions, but this is new. Because it’s new, it’s edgy. It is putting me at the edge of my comfort zone, peeking into new territory. I was surprised by the response to my post, which was essentially to get over it, with the reassurance that I would be sensational. Which brings me back to the opening paragraph of this blog post. I think those of us who take on a lot of multiple activities, while much admired, are often mistaken as being filled with absolute confidence at all times. I appreciate the kind reassurance of my friend on Facebook. And at the same time I’m aware of a slight feeling of being misunderstood or not seen, or at least not being seen in my fullness as a human being. Me: nervy, edgy, ambiguous, doubtful, uncertain, sensational. All of the above. Mindfully. Do you experience the internal crossroads of fear and excitement? How do you deal with it? 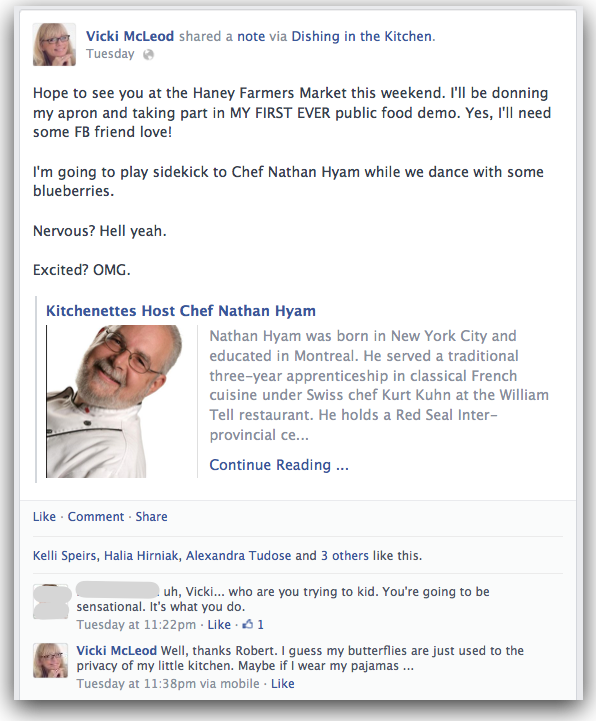 To find out more about the amazing Chef Nathan Hyam and our adventures with blueberries, visit Dishing in the Kitchen. Recipes included. Yes, I totally get that! At times, things come so naturally to me, I'm confident and I seem to be an infinite source of creative ideas. Then other times, I'm nervous, insecure, and flat out freaking out that I'm going to bomb a project. I've never had a job where I'm on such an emotional rollercoaster as I am with photography. I think the difference is the passion I have in it.